Each year, one of the highlights of my life is to update this document to reflect the changes that have taken place in the world of online marketing to the GLBT community, both in the US and worldwide. Some aspects of online marketing have really matured and come of age at this time, while others have leapt seemingly out of nowhere to become major players this year. What I’ll do here is start with the basics and work our way up to some of the new and exciting, more guerilla-style marketing techniques one can employ when trying to reach gays & lesbians on the Internet. Some of these suggestions may only apply to a smaller business, such as online directory advertising, but for most businesses large and small, the majority of the opportunities are quite consistent for each. I believe this is the first and foremost area any business, large and small, should focus on first. You want to maximize your opportunities for Natural [translated as FREE] Search results, putting your attention specifically at key word phrases an online user should and would use when finding businesses similar to yours. Whether it’s free or paid search, don’t go too wide and too liberal here or you’ll be frustrated, and with paid search, you’ll waste money on click-throughs that mean nothing to your business. If you’re a gay hotel in Miami, you’ll want to show up in the top 10 results when someone types in “gay hotel Miami”. One way to accomplish this is to ensure that your web designer has programmed your Title Tag with the relevant information about your property. A typical title should be “Your Hotel Name – Gay Hotel Miami” or “Your Hotel Name – Miami Gay Hotel”. Search engines use this title tag as a key part of their information they use to index your site. Second come your meta tags, one for your site’s keywords and the other for your site’s description. Your web designer should have access to this information, but in case he does not, the information is widely available online for your web designer to be maximizing your natural search results. Remember, natural search placement takes some time. Google uses their own internal algorithm for determining who shows up first, second and third, and this algorithm changes on a regular basis and is kept proprietary [mostly so that website owners don’t try to trick their algorithms]. In general, the more links your site has from other sites Google has deemed important and given a higher Google Page Rank value to, the better. Google has a page rank for all pages of a website, ranging from 1-10. A good site in Google’s eyes is a site with a page rank over 5. Also, how long your site has been online will factor in to your placement in natural search. Of course, not all of us can or want to wait patiently to start getting visitors to come to our site when they type in “gay hotel Miami” and thus Google has their Paid Search option. With paid search, a business can create a text-based ad for their gay hotel in Miami, and select a variety of key word combinations one might use to find their hotel. “gay hotel Miami”, “Miami gay hotel”, “gay resort Miami”, etc. are combinations of search terms one could select for this property. Don’t purchase “gay hotel” and don’t purchase “gay Miami”. Both of these terms will cost you more money and the online visitors to your site will be frustrated as your site’s offerings will likely not match what they’re looking for online. The paid search option is completely based on “pay for performance” and you only pay when someone actually clicks on your ad. With Google, you get to set how much you’re willing to pay per click, which usually ranges from $0.25 to $1.00 per click. You can also set your daily maximum budget amount you’re willing to spend, so that you don’t go overboard and spend more than you can afford. If you tell Google you’re willing to go as high as $1.00 per click on a series of key word combinations you’d like to try out, the beauty of this system is that Google will tell you for each key word combination where your ad would likely show up at $1.00 per click. For popular terms, you’ll then know if you’re going to be Ad #1, Ad #2, etc. right away. For less popular terms, you’ll more than likely be #1 or #2 and pay much less than the $1.00 per click maximum you said you would pay, as the less popular terms simply have less competition paying for those key word combinations. Thus, the term “gay travel” would command a much higher rate than “gay travel Miami” would. Once you get started with Google Paid Search, you’re then able to see every detail of your campaign in action, including how many people viewed your ad, clicked on your ad and where your ad appeared in context to other ads on that same page. You can then use this information to continually fine-tune your campaign. From our example above, the most important thing you want to do right after focusing on your Search Results is to examine which websites do come up on the search term key phrases you are doing research on. Thus, if you are a gay hotel in Miami, you would be researching how well you’re doing for such search terms as “gay hotel Miami”, “gay Miami”, etc. and you would be coming up with a set of other search results for other key websites appearing in the Top 10 and Top 20 search results for these key phrases. So make outreach to those sites! They may offer a wide range of advertising options, including e-mail campaigns and banner ads, as highlighted below. What you will find is that a few of these websites are online directories... basically Internet Yellow Pages serving the online GLBT community. These directories, if properly laid out, will have free listings and paid listings, with the paid listings appearing above and beyond the free listings in the search results, often with more descriptive text about the businesses they are advertising, and including a photo or two and a web link to the business website. There are online directories for almost every niche in the GLBT marketplace, including LambdaResorts.com and PurpleRoofs.com for hotels and resorts, and GayRealEstateAgents.com for the real estate market. For almost every business niche ranging from travel to real estate to mortgage brokers, there is an online directory serving this niche in the GLBT online community, and the advertising options they offer are often quite reasonably priced and can be very effective in your online marketing outreach. Online directories that cater to a broader audience include LambdaBusiness.com, GayFriendlyBiz.com, GayBusiness.com, GayYellowPages.com, and GLYP.com. Larger GLBT websites with a strong online directory component include GayBusinessWorld.com, zoom.gay.com and PinkBananaWorld.com/business/. This is still the most traditional form of online advertising today, and I believe will continue to be so for years to come, although I believe you’ll also see more “leveraged” banner ad campaigns undertaken, as described below as “Banner Advertising Plus!” in the Advanced Online Advertising section. Banner ads still come in various sizes, but the current standards and most common banner ad units used today are the 728x90 leaderboard [measured in pixels], the 300x250 square ad, the 468x60 banner ad and the 160x600 skyscraper ad. Banner ads are typically sold on a CPM basis [cost per thousand banner ad impressions delivered]. The rates vary based on the ad placement you are making. If you are a realtor in Minneapolis, and you are advertising on only web pages dedicated to real estate in Minneapolis, you won’t find a lot of banner ad impressions to buy, but the quality of the click-throughs coming over to your site will be high. Typically these types of focused banner ad buys are the most expensive, while banner ads purchased as “run of site” on a general GLBT website would be the least expensive. Rates typically range from $5 to 15 CPM, and some sites do have minimum ad buys of $500 to $1000 on the low end and $10,000 on the high end of that minimum. There are various methods from which you can purchase banner advertising. You can go direct to the website of your choice and request a proposal. This will often be the most effective and best customized campaign your company can buy, as you have a direct relationship with the publisher. You can also utilize an online media placement firm to do the buying for you, or you can place with any one of a number of advertising networks. In the gay media placement space, there is Pink Banana Media and Rivendell Online handling strategic online ad placement, and in the gay network space, there is the Gay Ad Network as well as a gay division in BlogAds.com. These companies can place your banner ads on a wide variety of websites and blogs within their network, and at times can even target based on geography [geotargeting], gender and more. They can also implement frequency caps so that your ad only appears a set number of times for the individual consumer viewing your advertisement. During, and at the end of the campaign, the measurements you will receive from your ad campaign will be banner ad impressions delivered by each site, and the click-through rate measuring how many individuals clicked on the banner ad and went to your site. Typical banner ad click-through rates are 0.5 – 1.0%. Further measurement and analysis would typically be done on your end using your own website analytics. There are a variety of high-quality website analytics programs out there, including one by Google. These analytics programs can then tell you where the user clicked over to, how long they stayed on your site, and with some programs, if they actually made a purchase. E-Mail advertising is the modern day direct marketing of choice. There is nothing to print and nothing to physically mail out. Everything is sent via e-mail, and thus the trick is to work with an e-mail list that is best suited for your product or service. To start, the best e-mail lists for you to market to will be your own. You can capture e-mail addresses directly from your own website, utilizing various enhancements to boost e-mail capture such as online sweepstakes, contests, quizzes and more. Offering such compelling features such as a “vote for your hottest male celebrity of the week” can really boost membership to your site and thus your e-mail lists, as you can require anyone wishing to vote to be a registered member of your site. Single opt-in e-mail addresses means that you accepted everyone at face value who has submitted their e-mail address to you. Double opt-in means that you confirmed via e-mail with the recipient that he/she wishes to be on your list. Double opt-in is considered an industry standard nowadays to ensure that the recipients of your e-mail advertisements and newsletters won’t consider your e-mail as spam. Once those sites are identified, you can then request a proposal for those sites to deliver your e-mail message. Typical rates are from $15 – 50 CPM, and the minimum ad buys with e-mail are often less than with banner advertising. You can send the websites you choose to advertise with a finished HTML e-mail of your design, or you can send them plain text and either have the plain text sent out, or have the websites customize this text with a photo or two, based upon their e-mail template. A well designed e-mail is one that integrates text with imagery in a clean, concise format. Too much scrolling down to read a message results in a lower click-through rate. You want the majority of your message to be easy to read and “above the fold”, viewable without scrolling. What can be measured in an e-mail campaign is how many were sent out, the open rate [how many recipients actually opened and viewed the e-mail], and the click-through rate. Typical open rates range from 20-30%, while click-through rates range from 10-15%. With some programs, you can even determine which individuals opened your e-mail and how many times the e-mail was forwarded to a friend. The page [or pages] that are viewed when someone clicks on a link in the e-mail is called a “landing page.” The concept of landing pages is important. You want the message viewed for each individual link to be relevant to the subject, meaning if the link says “click here to view our online calendar”, don’t take them to the front home page of your website and make the user “find” the online calendar. Always link directly to the web page on your site that is the most direct “call to action” and is directly relevant to the message the user is reading about. As a side note, e-mail testing is quite common nowadays. Say you were to send your e-mail out to 100,000 recipients. If you weren’t 100% sure which message was the best one to send out, you could send a sampling of 10,000 recipients one message, and a 2nd sampling of 10,000 recipients a 2nd message. You could then confirm which one performed best and then settle on that campaign message for the remaining 80,000 recipients. 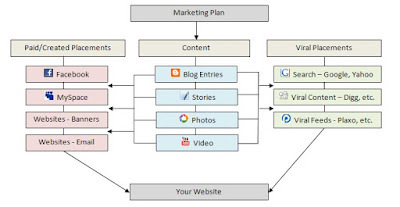 OM (Online Marketing) is a process of marketing a service, a product or a brand through the Internet. There are various forms of online marketing - SEO, SEM, E Mail Marketing, Online Advertising, Social Media Marketing, (includes blogs, social networking, social bookmarking etc).Today, world’s Internet penetration is close to 16%. With such a huge population on the net, businesses can no longer afford to ignore this medium. Online Marketing is finding a very important place in the budgets of all types of businesses, across the globe.